With the growing prevalence of heart valve diseases, it is important to better understand the biomechanical behavior of normal and pathological heart valve tissues. 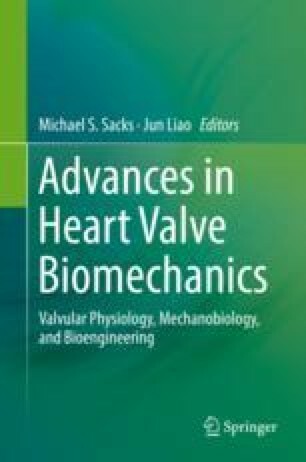 Recent studies showed that heart valve leaflets exhibited a unique functionally elastic behavior, in which valvular tissues exhibited minimal hysteretic and creep behaviors under biaxial loading, yet allowed stress relaxation similar to other types of collagenous tissues. This unique behavior is in favor of heart valve function, enabling leaflets to bear peak physiological loading without time-dependent deformation. To explore the underlying micromechanical mechanisms, we used small angle X-ray scattering (SAXS) under biaxial stretch to explore the collagen fibril kinematics in stress relaxation and creep. We found that collagen fibril reorientation/realignment did not contribute to stress relaxation and creep. In stress relaxation, collagen fibril strain released largely during the first 20 min and the remaining collagen fibril strain stayed relatively constant in the remaining relaxation time. The overall reduction rate of the collagen fibril strain was much larger than the stress decay rate at the tissue level. When the leaflet tissue experienced negligible time-dependent deformation under constant load (negligible creep), the collagen fibril strain was maintained at a constant level during the time course. This difference in collagen fibril kinematics implies the mechanisms responsible for creep and stress relaxation in the leaflet tissue are functionally independent. We thus speculate some type of fibril-level “locking” mechanism exists in leaflet tissue that allows for stress release under constant strain condition, yet does not allow for continued straining under a constant stress. We speculate that the degenerated ECM components in diseased valvular tissues might cause changes in these quasi-elastic behaviors and thus contribute to malfunction of heart valves. The authors would like to thank the support from AHA BGIA-0565346, GRNT17150041, NIH 1R01EB022018-01, and UT STARS.